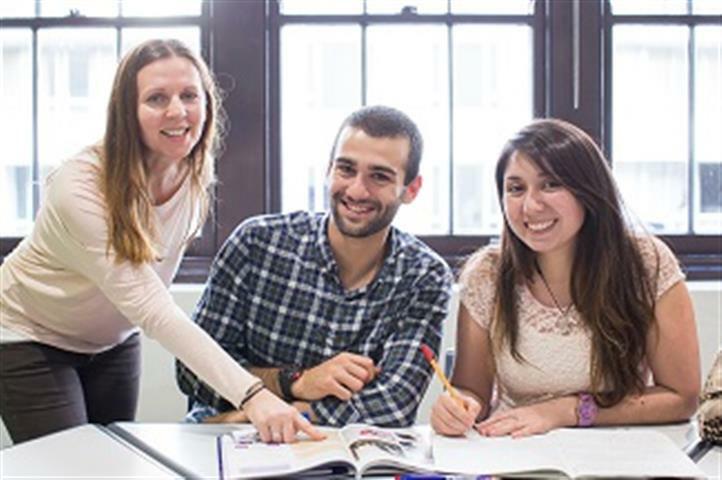 The Langports Foundation raises money to help dis-advantaged children through education. 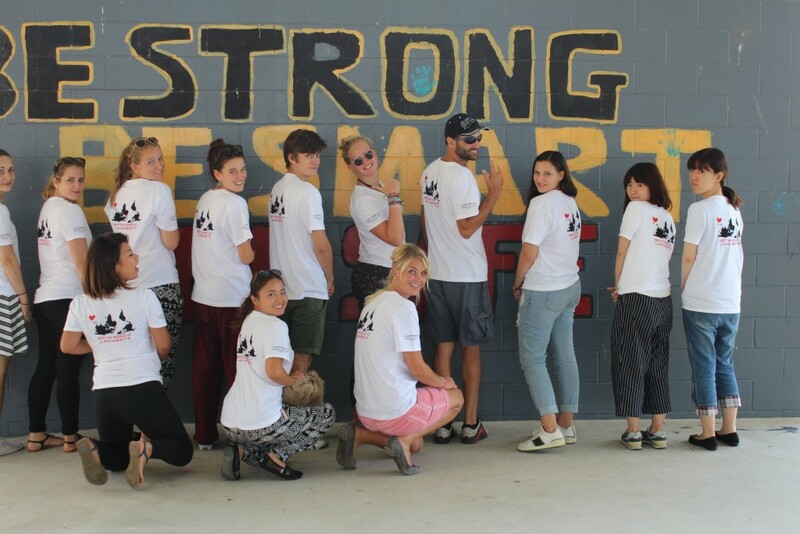 Our project, End of Year Prizes for Cherbourg (an Aboriginal school 4 hours North-west of Brisbane) was completed this December and we would like to tell you how it went. 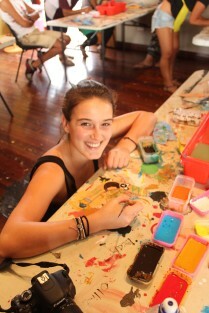 On December 3rd and 4th, Susie France and 14 Langports students from Brisbane and the Gold Coast schools visited the Cherbourg Aboriginal Community. On Thursday they spent time learning about the town of Cherbourg at the Ration Shed Museum and had dinner with two elders from that town. 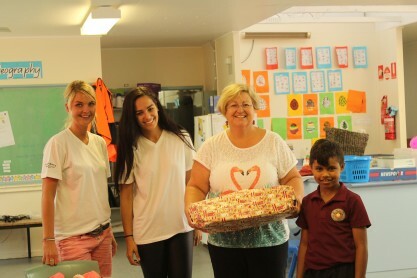 The following day, our students visited Cherbourg State School and spent time in the classrooms teaching the children about their countries of birth. We had students from Japan, Switzerland, Italy, Brazil and Germany. 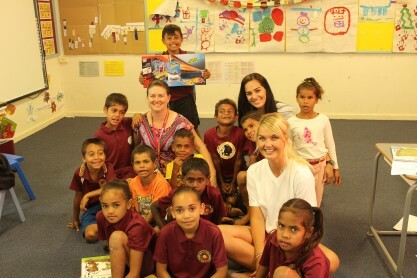 The children were very excited to meet them, and at the end of the visit, each child was given a new reading book. Part of the project is to raise awareness of the importance of school attendance and so the Langports Foundation gave 10 special awards to the top ten attendees at the school this year. There was much excitement in each class as the classmates watched a student in the class receive their prize and open a ‘big’ present. We will continue to support this school in this way in 2016. Please read what some of our students thought of this project. 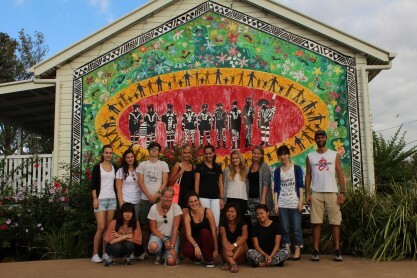 “When I heard about the opportunity to visit an Aboriginal town and an Aboriginal school I was sure that I want to join this trip. I think this is really a great chance to learn something about the history of Australia. When we were visiting the museum, the Ration Shed I was honestly shocked. I didn’t know a lot about the history of the Aborigines, so I was surprised how everything was in the past. In the evening we had dinner with the Stanley family. That was great! It was so interesting to hear what they’ve told about the past and their own experiences. That was one of the best part of the trip. “Last Thursday, I watched 2 DVDs about Aborigine. I hadn’t known the detail of Aborigine’s history before I watched DVDs. So, I was glad to know about it. And I made a boomerang. I had never made it and I’m not at good at painting. But, I enjoyed! Also, I saw Aboriginal paintings at museum. These paintings are so beautiful. 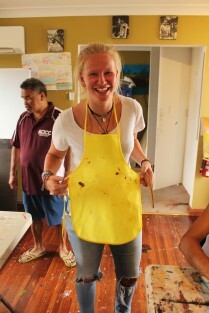 After we arrived at motel, we ate dinner with Aboriginal people. 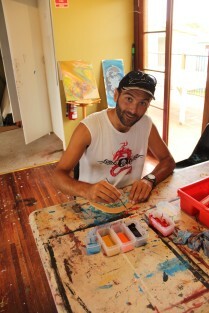 They were kind to me, and I could directly listen to an Aboriginal person. When I prepared a cup of coffee she thanked me. And she gave me her bag for me. I was so happy, but I couldn’t say thankful message smoothly. I could say to thank you to her. But, I wanted to tell her about thankful message more. Last Friday, we went to Aboriginal school. I gave some present for teacher and children. And I played with children. They are so cute and cheerful. When I showed some pictures, their eyes are so brilliant.